This past week I have come across a new favorite app, that is now sitting on my iPhone. 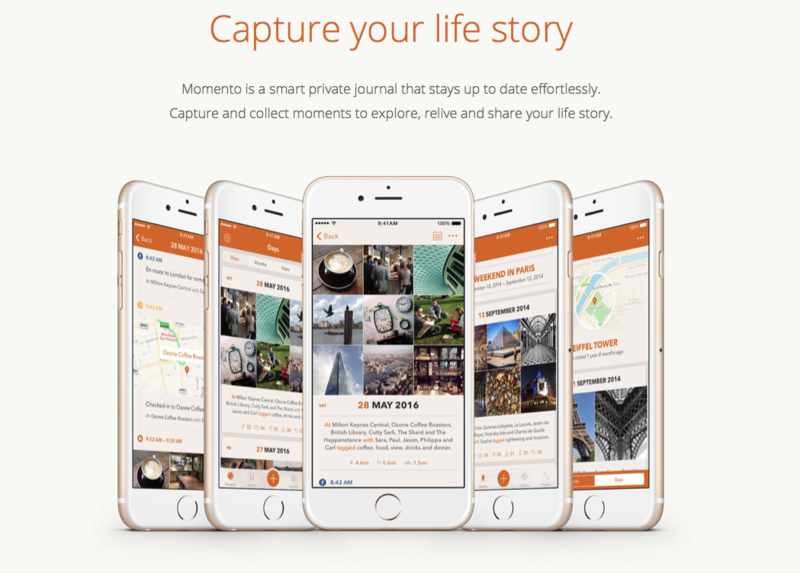 Momento was featured this past week with several apps in one of Apple's daily lists. Momento caught my as a private journaling app that has a really clean interface and the ability to automatically import content from your social media. I like the idea of a private journaling app at lot to just capture quick things throughout my day. The added benefit of the social integration makes that even easier because my Facebook, Instagram, etc. posts can automatically find their way into the app, which makes it ideal for weekend and vacation adventures. What is particularly cool about the social media import though is that it will actually bring in content that you are tagged in from someone else. If a family member tags you in a photo and posts it on Facebook, it will capture that automatically. Even cooler still, is that it is smart enough to see all of those tags across different social networks and identify those people or places. So you can then go in and find your spouse for example , and find everything, going back years with photos and posts with her. Another great feature for just looking back on your journal is the "One this day" feature on their calendar. You click on it and you can see every entry for that day/date going back years. It is sort of cool, but also freaky that Facebook has content back to 2008. This app has filled two holes for me. I was a big fan of Flavors.me, which was a personal landing page website that aggregated all of your social media into one place. It was a great tool that really should have a replacement online. This doesn't replace that for a public profile, but offers a lot of the same features for private use. The other app it replaces is Foodspotting. I loved Foodspotting and it was my goto app for taking my food photos. Unfortunately it hasn't really been updated in years and while Instagram and Foursquare can serve that purpose for public usage, having something for private food tracking that can tag people and places is nice to have. Evernote Food unfortunately never got a replacement app. So I would highly recommend people check this out if they are looking for a great app to have a quick and small personal journal. It is also a very affordable app to ranging from free to about $4 depending upon what you want to do with it.